After landing on the beaches of Normandy, soldiers spread out to liberate Europe from the Nazi regime. 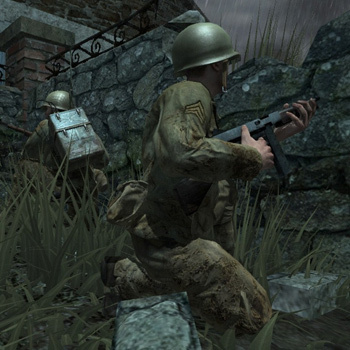 In Call of Duty 3, single players focus on the stories of four Allied soldiers that begin at Operation Cobra and lead to the eventual Liberation of Paris. Game room generals will lead the group through 14 missions filled with multiple attack routes as a member of either the American, British, Polish, and Canadian armies. Each path requires the use of special tactics in order to navigate the course effectively. Soldiers come equipped with special skills such as the British SAS soldier's knack for sabotage, and the Canadian mechanized infantry's expertise at inventive vehicles. Internet action is available for up to 16 people in a single or split-screen game. Players choose from five different classes of character such as medic and anti-armor, and then customize gameplay options. Several game types include "Team Battle," "Capture the Flag," "War," "Headquarters," and a single flag "CTF" that can be played out on many different maps. Environments include deformable objects such as piles of wood that move and splinter when shot, and players may destroy soft cover to flush enemies out in the open. Additional "Battle Action" invites gamers to shoot less and get their hands dirty setting C-4 charges, and fighting Germans with their bare hands.